Readers with good memories will recall that in 2015 there were two versions of the 100g Special Delivery cylinder block because half the panes on the cylinder were missing the cylinder number for the iridescent ink. This was reported here. 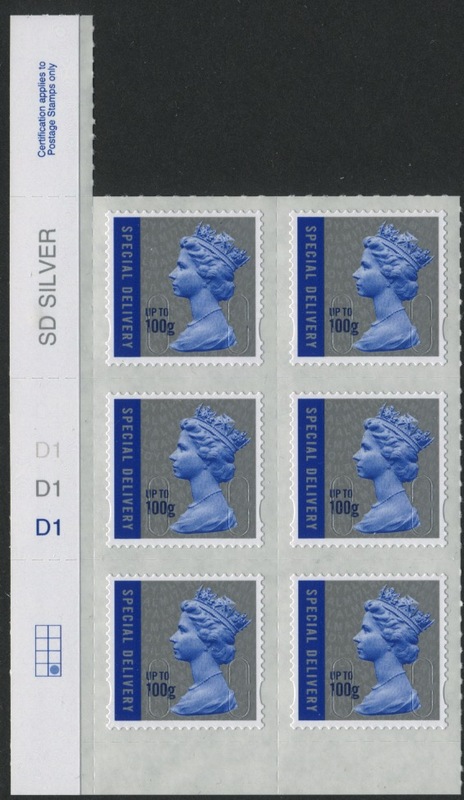 Now a similar but different error has been found on the M17L printing of the only stamp that is the same size as the Special Delivery (SD) stamps, the 1st class Signed For. The Signed For (SF) stamps are printed in guttered sheets of 50 (two panes of 25), where as the SD stamps are distributed in sheets of 25. Thus the SD has 8 grid positions, but the SF only 4: the basic cylinder is the same size. In the case of the SD stamps all 8 grid positions carry cylinder numbers, while the SF stamps only have cylinder numbers on the lower pane on each of the four positions. 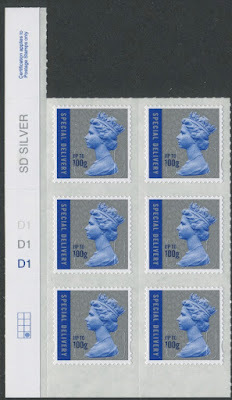 However, if De La Rue use the same iridescent cylinder for both stamps, the upper pane on the SF stamps would have an unnecessary iridescent cylinder number, and that is what seems to have happened. The first picture shows the ordinary cylinder number from the lower pane. This picture shows the upper pane with the colour name in the margin and the gutter at the foot, with an iridescent cylinder number against row 4 as with the lower pane. The ideal way to collect these would be to have the complete strip of 2 columns from top to bottom of the primary sheet - 20 stamps - showing the phantom, the gutter and the correct cylinder number. However, such a strip is over 310 mm, and too long for most albums, even A4. 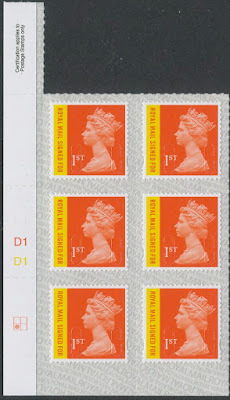 The next best way is to collect a cylinder block of 6 plus the top two rows from the lower pane below the gutter, showing clearly that the stamps come from the top pane. We have obtained some of both arrangements: customers are invited to email for details before we put them on our webshop. Does anyone actually use these stamps? 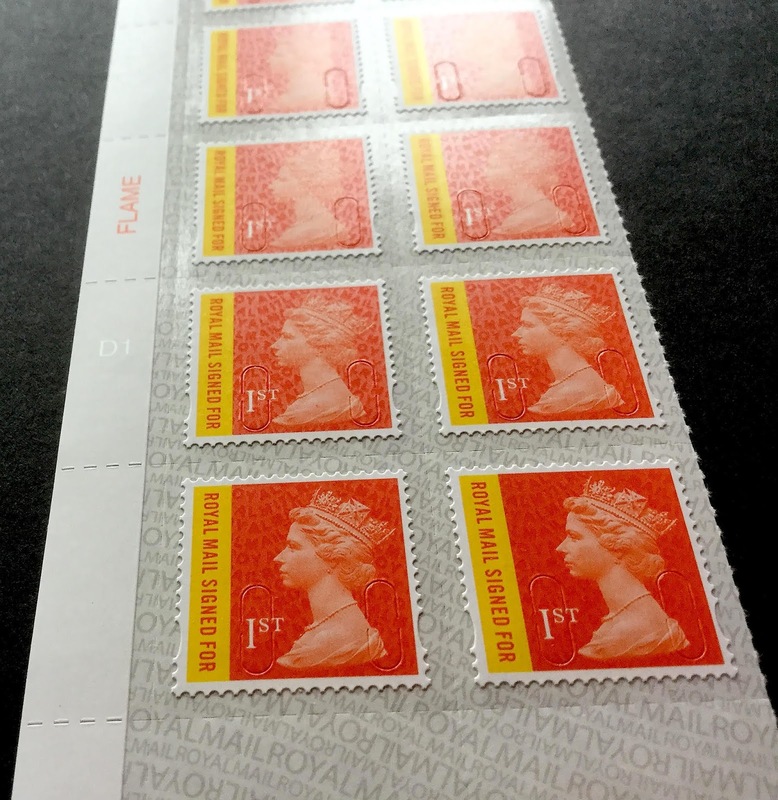 Plenty are still used by small businesses who use stamps, and who want their post to be scanned over the counter without the delay of also having a label printed.